Beginning in the 1990's, the number of tornadoes has increased dramatically with wider variations from year to year. This increase is do to the deployment of Doppler radar and improved spotter training. There was also an increase in storm chasers using cameras and cell phones to document storms. 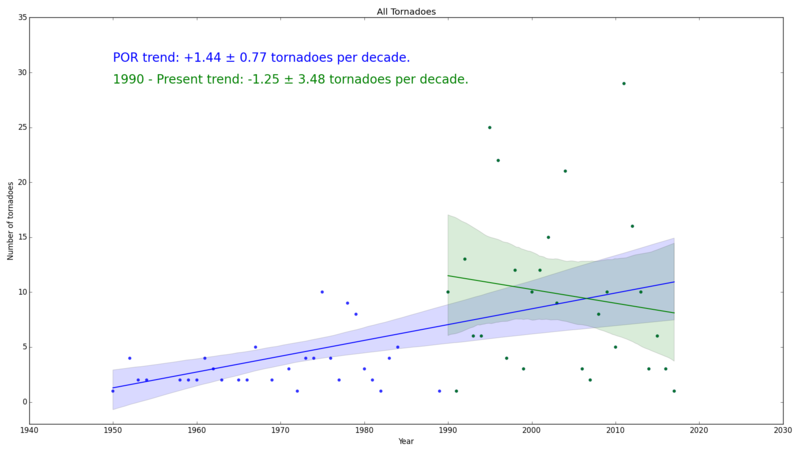 We can estimate the trend in tornado occurrence using a least-squares regression to attempt to model the relationship between time and the number of tornado occurrences. The shaded area around the regression is the confidence interval for the regression. There is a 95 percent probability that the true regression line for the population lies within the confidence interval for our estimate of the regression line calculated from the data. We can examine whether the regression range excludes 0. If it does, then we can rule out the likelihood that the slope is 0. 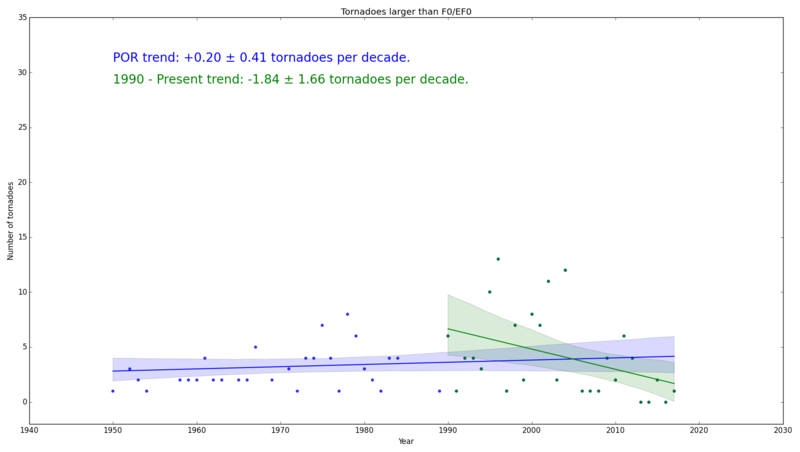 Thus, we conclude that there is a significant linear relationship between time and the number of tornado occurrences. The first figure shows the annual number of tornadoes per year in Maryland since 1950 plotting data from NCEI's Storm Events Database. Looking at the more homogeneous record starting in the 90's we see the uncertainty in the regression includes 0 and we can not be certain of the rate of change in number of tornado occurrences. The second figure shows the lack of any systematic change in the stronger tornado events - those classified as F1 to F5 in the original Fujita Scale or EF1 to EF5 on the Enhanced Fujita Scale. These represent the tornadoes that cause at least moderate damage and are well documented. 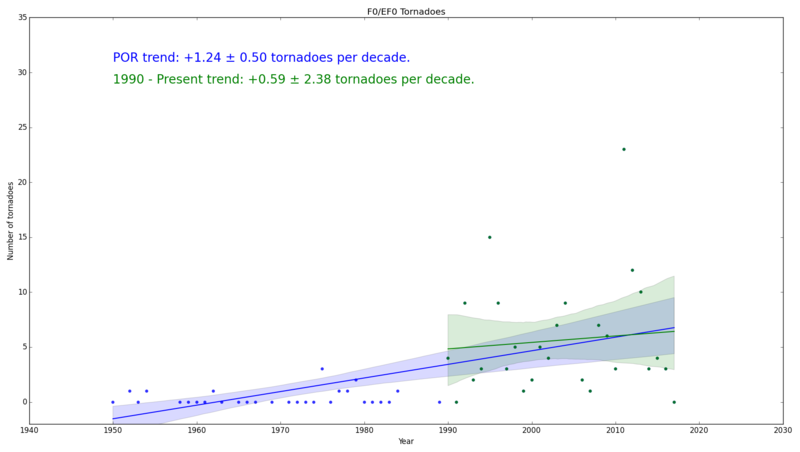 The third figure shows the upward trend in the number of the weakest F0 tornadoes. These rarely cause any damage. The upward trend in recent years is the result of better radar systems, better spotter networks, and increased awareness and interest by the public. Looking at the more homogeneous record starting in the 90's we see the uncertainty in the regression includes 0 and we can not be certain of the rate of change in tornado occurrences. The Midwestern Regional Climate Center has developed a tornado track database that utilized data from 1950 to 2016. Users can select tornadoes based on magnitude, specific years and months, and if there were any injuries or fatalities.